Sometimes it seems appropriate that the title “Judges” should be changed to “Lawdges” (don’t try to look this word up, it doesn’t exist – yet). It’s time we added it though, to our dictionaries as a way of keeping up with the changing times. When the word “judge” came to our vocabulary it meant to provide “justice”. This is no longer what the judges in Egypt provide. They occupy courts of law (at their best), and not courts of justice, and, as such, “Lawdges” seems a much more appropriate title. When the execution of the law becomes unpredictable, it’s nerve wrecking. Committing a crime and getting caught, waiting for the proportionate punishment that you subconsciously calculate, is not as terrifying as the anxiety you suffer when the law and the personnel that execute it are unpredictable. 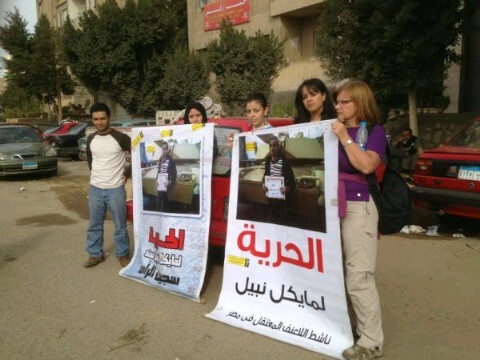 That’s what’s wrong with Egypt today for the activists; unpredictability. The recent unrest in Egypt is ignited by different events and during the aftermath of each of the tragedies that the country has witnessed has always included and ended with questions of cleansing the judiciary of corruption. 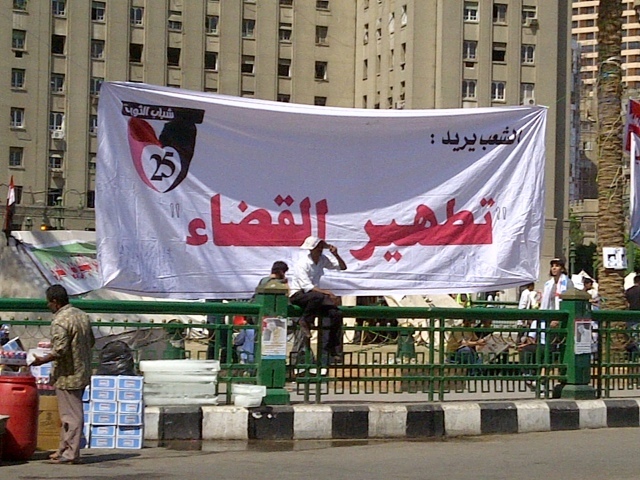 The photograph above is of a sign hung up in Tahrir Square on many Fridays saying: “The People Want Purification of the Judiciary”. Maikel Nabil Sanad, Egypt’s first prisoner of conscience after the revolution, was arrested on 4 February by military police and tortured, but released 27 hours later and again arrested from his home in Cairo at 10pm on 28 March 2011 for a blog he wrote titled “The army and the people were never one hand” – a slogan that the hundreds of thousands of Egyptians took to the streets chanting for months later. He was sentenced to three years’ imprisonment on charges of “insulting the military. It was no coincidence that Maikel was singled out. In April 2009, he founded the “No to Compulsory Military Service Movement”. Maikel demanded that he be exempted from military service after declaring his conscientious objection and as a consequence was arrested on 12 November 2010, also by the military police. He was released two days later and finally exempted from military service, but on medical grounds. As the regular six protestors stood outside the Military Prosecutors, better known as C28, news came from Maikel Nabil’s lawyer, Amir Salem, that the judges had given Maikel an ultimatum. He came out of court frustrated telling us the verdict would be postponed for the third time. The judges told Maikel that they were willing to pass a verdict of pardon should he accept logging on to his blog and publishing a public apology. Steadfast in his conviction that he had done nothing wrong, Maikel refused and the judges holding grudges, sent him back to El Marg Prison and a rehearing planned for the 14th December. There are no laws in Egypt that result in pardon when a criminal “apologizes”. The frustrations at the unpredictability of the law here drove Maikel to escalate his hunger strike to include medications and liquid. Alaa, one of the most prominent and level headed revolutionaries, was released Christmas morning pending further investigations for 15 crimes attributed to him, the most serious including inciting secular violence and stealing weapons from army personnel. While he was missed during his time in prison, his smiling photos made their way around twitter and news channels. His smile, one confidence of having not done wrong, and his heart breaking letters to his wife after she gave birth with him inside to his first son, touched the hearts of those who knew him and those who had just read about him each time his 15 days were renewed. Manal and unborn baby Khaled had held on. Alaa wanted to be there by Manal as she was giving birth to their first baby. Named after Khaled Saeed, the little baby was the product of a decision his parents had made during the 18 days of revolution in 2011. Manal and Alaa had at last felt this was a world they would not feel guilty having a baby in. Every hearing Alaa’s family had hoped he would be released and would be able to attend the birth. The judges postponed every hearing ensuring that Alaa would miss it. Alaa’s smuggled posts out of prison spoke of his fear when he realized how unpredictable, how random, how unfair the trial was. Both military and civilian courts ignored international human rights organisations pressure for the release of Alaa due to a lack of evidence and because of a multitude of witnesses and evidence proving his innocence. 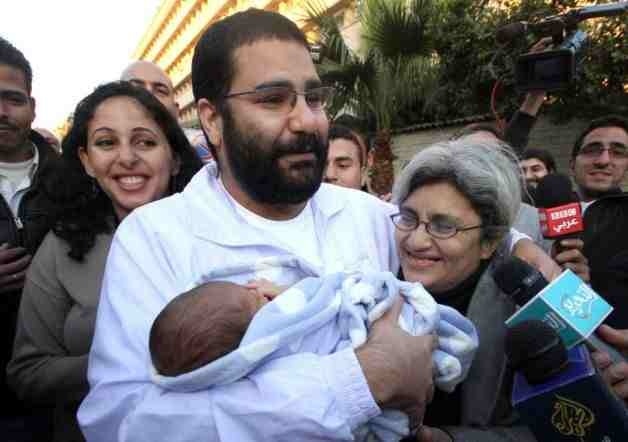 And true to the expectations of those who noticed the pattern, Alaa was given leave the hearing after Khaled was born. Whether or not the charges against Alaa are dropped, the judges holding grudges against Alaa took away something they knew he ached for; in his own words to his wife, “to see your face as you see Khaled’s face for the first time”. The good news is that unlike the people who lost their sons and fathers in this revolution, Khaled would grow up knowing his father and living amongst the revolutionary family of which he is part. Political activist Mohamed Jamal, member of a coalition of committees defending the revolution, was murdered 21 January 2012 at dawn, in front of the High Court, while he was on his way home after a protest in front of the public prosecutor’s office demanding judiciary reform. Mohamed is reported to have left the protest at 4am after organising more marches calling for judiciary independence leading up to bigger protests 25 January. Only minutes after leaving his friends, he returned to the sit-in in front of the public prosecutor’s office bleeding of a stab wound. He fell dead pointing towards the High Court. The murder was recorded against anonymous. On the same day, political activist Kareem Abo Zed, member of the revolution coalition in Algharbya governorate, died in an accident on the desert road, on his way to El Menya governorate to attend the 2nd Conference of Egypt’s revolutionaries. No murderers were arrested and the coincidence between the deaths of two activists calling for peaceful demonstrations was not investigated. The Arabic Network for Human Rights Information said that “The government is the body responsible for the safety of citizens, and its failure to bring the perpetrators to justice is considered to be collusion”. The judiciary has so far been unaffected, despite the challenges and efforts of those working to raise awareness of the need for reform. The continued protests, related murders and accidents indicate that till the need for cleansing is addressed with urgency, integrity and transparency, then Egypt will see a continued increase of cases that raise a multitude of question marks and grievances that cannot easily continue to be ignored.